Elephants are flooding into Botswana as refugees from violent conflict and poaching, said founder of Elephants Without Borders, Mike Chase in an interview with the Sunday Standard. Elephant poaching in Africa is a growing problem across the continent, but particularly in countries where political conflict and violence is rife he said. According to Chase, Botswana is feeling the impact of poaching in Africa as tens of thousands of the beasts make their way to the country to escape danger, he said he believes only around 40% of the elephants in Botswana are native to the country, while around 80 000 are “political refugees”. Thousands of animals fled from the south-east of Angola where elephants were massacred for their ivory and for meat to feed troops during the long and brutal civil war in that country. According to Chase as peace returns to Angola, so is the native elephant population who somehow sense it is now safe to go home. “We are talking about an animal that eats 250kg of food a day”, he said, adding that the beasts are decimating the country’s vegetation, destroying crop fields and escalating conflicts with communities of Northern Botswana. According to Chase the problem is not only from Angola but also neighbouring Zambia and Zimbabwe where poachers are forcing elephants to seek refuge in Botswana. “We are currently losing an elephant every minute in Africa,” he said, warning that we may be seeing the highest elephant mortality rate in history. Environment Wildlife and Tourism Minister, Tshekedi Khama said the government had adopted a “shoot-to-kill” policy against to poachers as a radical measure to illuminate the mass slaughter of elephants in the country. A Zimparks ranger was last Thursday locked up in remand prison for allegedly ordering his junior to shoot dead a suspected poacher who had tried to run away after being apprehended. Tafireyi Mailani (30) of Magazo area under Chief Sai in Gokwe South was not asked to plead to murder when he appeared before Gokwe resident magistrate Shepherd Mjanja and was remanded in custody to December 19. He advised him to apply for bail at the High Court. Prosecutor Mandla Ndlovu told the court that on January 5 2008 Mailani was in charge of a team of Zimparks rangers which was tracking poachers that had killed a buffalo at Chirisa Game Park. They were trying to locate one who was suspected to have killed a buffalo. They met a man who directed them where they could apprehend their suspect. When they approached the suspect, those with him took to their heels and the State alleges that Mailani ordered a junior officer, Kinos Ndiguneyi, to shoot Daniel Dube, who was among those who took to their heels. Dube died on the way to hospital and Ndiguneyi was later arrested. Mailani had been spared arrest until it recently emerged that he was in charge of the team and was the one who ordered Ndiguneyi to shoot Dube and was arrested last month. Environment Wildlife and Tourism Minister, Tshekedi Khama says the government has adopted a "shoot-to-kill" policy against to poachers as a radical measure to curb the mass slaughter of elephants in the country. Speaking in an interview with Sunday Standard at the end of Africa Elephant Summit that was held in Gaborone , Khama said the shoot to kill policy has proved to be an effective deterrent as it sends a clear message to poachers that they would be shot dead on the spot when caught red handed. “These poachers break many laws when they enter our country. Firstly they come armed with military weapons and secondly they enter the country at non gazetted points. Thirdly they engage in poaching which is illegal,’ said Khama. Asked if the move is not likely to create diplomatic tensions in the event that foreign poachers die during exchange of fire with anti poaching agents, Khama said neighbouring countries are aware of the “shoot and kill” stance that has been adopted by Botswana. “These people do not only shoot elephants but also other species. If they decide not to surrender and try to fight their way out, we will shoot them,” he said. The Environment Wildlife and Tourism Minister explained that if Botswana did not adopt the shoot to kill policy, which he described as an effective deterrent the country will lose a number of elephants to poachers. On suggestions that poachers have as much rights to be tried in courts like other offenders instead of being executed without trial, Khama insisted that it is unfortunate that the shoot to kill policy has proved to be an effective deterrent. “Unfortunately it is what is working at the moment,” he said. Khama said recorded cases of Batswana being involved in poaching are very few adding that they were responding positively to the education on the disadvantages of poaching. Khama said poachers undergo training and security agents should also be equipped with the necessary resources to match them. He said tourism plays an important role in the country’s economy hence the need to protect wildlife against poaching. “When a person enters the country at a non-gazetted point and carrying military weapons, he is breaking the law and he must be harshly punished,” he said. The number of African elephants killed by hunters and poachers has soared to 52,000 a year, sparking key ivory-trade nations into action. This week, they agreed on urgent measures to protect the majestic giants. In Swahili, "tokomeza" means to terminate. When Tanzanian President Jakaya Kikwete launched Operation Tokomeza, with its shoot-to-kill orders to deal with elephant poachers, he wasn't mincing his words. In the latter part of the 20th century, the same policy had been the key initiative in temporarily stopping the decimation of East Africa's herds. Introducing it to Tanzania was not a step to be taken lightly. But a crisis point had been reached. The President warned the country's MPs that the population of elephants now stood at just 15 per cent of the 350,000 there were 20 years ago. The country's porous borders, lack of enough scanners at the country's biggest port and poor ocean patrols have led to it becoming a poaching hub. It is hard to know who is involved in the highest level of poaching, because these people have ivory-processing factories and they collect ivory from all over the world, says Tanzanian Government spokesman Karamaga Canisius. "We don't have specific names due to the lack of a mechanism to trace containers." For example, a container is loaded in Tanzania with ivory, shipped to South Africa, where more ivory is loaded, shipped back to Tanzania in transit and then heads to Dubai, and so forth. Most seizures from Africa seem to have come from Tanzania because of how the network operates. But it is clear that most of the consignments are destined for Asia, especially China and Vietnam. So this week, key countries in the movement of illegal ivory around the world agreed on urgent measures to halt the illegal trade and secure elephant populations across Africa. Meeting in Botswana at the first-ever summit to focus on the entire ivory value chain, they agreed on 14 measures including classifying wildlife trafficking as a serious crime. This will unlock international law enforcement co-operation provided by the UN, such as mutual legal assistance, asset seizure and forfeiture, extradition and other tools to hold criminals accountable. The measures were agreed on by key African elephant-range states, including Gabon, Kenya, Niger and Zambia, ivory transit states including Vietnam, the Philippines and Malaysia and ivory destination states such as China and Thailand. This week, key nations along the illegal ivory trade route met in Botswana and agreed to implement a host of new measures aimed at stemming the trade. But agreements to crack down on the ivory trade have been made before; the trade is illegal, after all. With around 22,000 African elephants killed last year, what does the new agreement offer? The agreement made between 30 nations, including African host countries like Kenya, and Zambia; ivory trafficking hubs like Vietnam and Malaysia; and demand countries like China and Thailand, came at the first African Elephant Summit, which was touted by the IUCN, which hosted the meeting, as being "the first-ever meeting focusing on the dynamics of the entire ivory value chain." That's important because comprehensive action is need if skyrocketing poaching rates can be slowed. (And it must be, at current rates, as much as 20 percent of African elephants could be killed in the next decade, after two-thirds of Africa's forest elephants were killed in the last one.) As the poaching trade now mirrors the drug war in many ways, localized action—even threatening to shoot poachers on sight—won't stop poachers and traders from expanding elsewhere. But the international sale of ivory has already been banned since 1989, and at this year's CITES conference, countries involved in the wildlife trade already agreed to make progress or face sanctions. Yet poaching does not appear to be slowing. The new measure hopes to break the impasse with 14 urgent measures agreed upon by all the signatories. While some of them don't appear to be more than diplomatic fluff—Urgent Measure 11 says the countries agree to "develop and implement strategies to eliminate the illegal trade in ivory," which is kind of the whole point—but there are a few positive steps outlined in the agreement. The first measure agreed upon is key: All parties will "secure and report on maximum, and therefore deterrent, sentences for wildlife crime using a combination of existing laws and strengthened regulatory frameworks." Hopefully, streamlined regulations can make authorities' job easier in making arrests. But considering the fact that even a big bust doesn't prevent elephants from being killed in the first place, the deterrent effect of stricter penalties—if there is one, which is a big "if"—may be of even bigger importance. The shocking discovery of 706 tusks of ivory in Tanzania on 1 November was significant in more ways than one. First, the seizure of the 1.9-tonne haul from the home of three Chinese traders underscored the need to make the fight against ivory smuggling an international affair, and to seek the Chinese government's intervention in the same way that China is known to take drug smuggling very seriously. Second, following criticism of a shoot-to-kill campaign against poachers for which Natural Resources and Tourism Minister Khamis Kagasheki has been heavily criticized, the seizure served to blunt the accusations. "I admit that there is an ugly side in the operation, but what is happening now in arresting culprits and impounding tusks is part of the success of the operation," he said as he declined to step down from office. Critics say the campaign against poachers is being used to harass and intimidate innocent pastoralists, giving as it does a carte blanche for the police to kill at will. The issue of hunting also came to the fore, and that's a good thing. As Tanzania fights poachers, this is an opportune time to also reconsider the matter of legalised hunting, which may also provide a cover for poachers. Isn't it time this was disallowed in the country's laws completely or the least, ban hunting for say at least 20 years or more? But there is a more interesting debate that these recent events bring to the fore: the matter of the death penalty. Do poachers deserve death? Police and wildlife officers have cracked down on suspected poachers amid a surge of killings of elephant and rhino in the east African nation, operating under what was reported to be a shoot-to-kill policy and making sweeping arrests. "We are going to rectify such mistakes and take to task culprits, and later continue with the mission to fight poachers and protect elephants from imminent extinction," Kikwete told parliament. The campaign, launched two months ago, was dubbed "Operation Tokomeza", or "Operation Terminate". Parliament suspended the operation last week after lawmakers alleged a string of abuses including killings during the campaign. But Kikwete said abandoning the operation was tantamount to letting the poachers win, and that the efforts must continue, warning that animals were being slaughtered at alarming rates. Other reports say eight pastoralists from Orbomba Village in Longido District have not been seen since they were arrested last week. The anti-poaching campaign in the country has come under sharp criticism following reports of widespread human rights abuses, including the killing of a woman believed to have died at the hands of officers of the anti-poaching unit--which is comprised of the police, the army and intelligence officers. Emaliana Gasper Maro, 46, is reported to have been snatched from her house by people who identified themselves as anti-poachers. They said they wanted to question the resident of Galapo in Babati, Mara Region. This came only a few days after they reportedly grabbed her husband, Elias Kibuga, 56. Mr Kibuga has not been seen since but Emiliana’s body was found at Mrara hospital mortuary in Babati. Scores others are missing. The officers are also said to have burnt houses and are reported to be holding large herds belonging to pastoralists in Arusha region. The government has reportedly been urged to stop the exercise and ensure that lives and property are respected. Yesterday, the government came under attack from MPs in Parliament over claims of widespread abuse of human rights. The Manyara region police commander, Mr Akili Mpwapwa, confirmed the reports but said an ongoing investigation would unearth the truth. “I have received reports of the death of Emaliana and the investigations have started,” Mr Mpwapwa said. The results of a post-mortem that was jointly carried out by the police and the family doctor have not been made public. In my last post I deployed the trite metaphor regarding an elephant in the room. I even had the gall to suggest that elephants are lazy creatures! Given that governmental ministers in Tanzania are now considering a “shoot-to-kill” policy against elephant poachers, thus backing a kind of jungle-based ad hoc capital punishment approach to the illicit ivory trade, I’m reconsidering the wisdom of using anti-elephant language. The word choice authorities hover over The Pitchfork with the eyes of an eagle (I think I’m okay on that one) and I’m feeling the wither of their gaze. In all seriousness, tens of thousands of elephants are killed by poachers every year in Africa and many advocates indeed believe that the threat of death may be the only effective deterrent. Good idea? 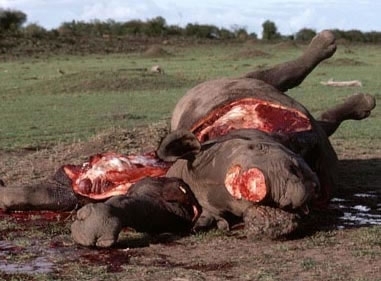 Poaching is a murderous act that warrants the full weight of punitive justice. But death—especially when delivered under duress in the thick murk of the jungle—shouldn’t be a viable legal option. Authorizing open season on poachers would only antagonize an already enflamed situation, engendering more violence and habitat destruction. What’s instead needed is better funding of game wardens, better enforcement of existing laws, and programs that support a level of non-animal based economic development that makes poaching less of an alluring option for poachers caught in their own web of interlocking oppressions. Plus, advocates of animal rights, human rights, elephant rights, gay rights, civil rights, whatever rights, are almost always better off choosing ameliorative methods that do not implicitly condone what we’re trying to eliminate in the name of decency, compassion, justice, and peace. The Minister for Natural Resources and Tourism, Ambassador Khamis Kagasheki has announced unyielding measures against poachers which include proposing changes in law with regard to poaching. He has ordered wildlife rangers to execute directives aimed at curbing poaching including use of all possible force. Authorities recently announced intention to use the military in curbing poaching. "I am very aware that some human rights activists will make an uproar, claiming that poachers have as much rights to be tried in courts as other persons, but let's face it, poachers not only kill wildlife but also usually they never hesitate to shoot dead any innocent person standing on their way," stated Mr Kagasheki. The Minister was speaking at the climax of the global 'Elephant March' held in 15 countries worldwide and in Tanzania. The about 5 kilometers mass walk was held on October 4 in Arusha, which is the country's capital for tourism. The march started in Majengo area and ended at the AICC Club grounds in Kijenge area, east of the city. The minister warned that illegal hunters gunning for elephant tusks have wealthy international barons backing their rackets thus well equipped with advanced weaponry and usually can afford all legal assistance. "That is why you always hear that, court cases against poachers take very long and sometimes the culprits get acquitted and the only way to solve this problem is to nip the problem in the bud," maintained Mr Kagasheki. The illegal ivory trade could be as much of a boon to armed rebel groups as it is bad for elephants. But is summary execution ever a good idea? Tanzania, ground zero of Africa’s elephant poaching epidemic, is considering a controversial bit of legislation aimed at punishing the hunters that are wiping out 30 to 70 Tanzanian elephants a day. It’s just a teensy more severe than a regular old fine or jail time: On Friday, Tanzania’s Minister for Natural Resources and Tourism, Khamis Kagasheki, suggested that the only way to get rid of poaching was to shoot poachers on the spot. Tanzania boasts as much as a quarter of all the elephants in Africa, but by some estimates, the country’s lost more than half its elephant population since 2007. Between 2009 and 2011, Tanzania ranked as the top exporter of black market tusks in the world. "I am very aware that some alleged human rights activists will make an uproar, claiming that poachers have as much rights to be tried in courts as the next person, but let's face it, poachers not only kill wildlife but also usually never hesitate to shoot dead any innocent person standing in their way," Kagasheki told AllAfrica.com. A government minister in Tanzania has called for a “shoot-to-kill” policy against poachers in a radical measure to curb the mass slaughter of elephants. Khamis Kagasheki’s proposal for perpetrators of the illicit ivory trade to be executed “on the spot” divided opinion, with some conservationists backing it as a necessary deterrent but others warning that it would lead to an escalation of violence. There are already signs of an increasing militarisation of Africa’s wildlife parks with more than 1,000 rangers having been killed while protecting animals over the past decade, according to the Thin Green Line Foundation. Tanzania is said to have lost half its elephants in the past three years.